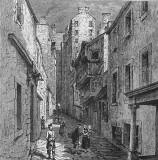 Here are many closes leading into the High Street and other parts of the Royal Mile. These closes are narrow lanes on either side of the Royal Mile. They pass between the high buildings and emerge into the Royal Mile.